I fell down the stairs and landed badly on my ankle. Doug was very friendly and after one session managed to get me walking again! He used a range of techniques including acupuncture and sports massage. I would definitely recommend! Thank you Daryl for getting me going again following my recent hip injuries. The treatment and advice seem to be working. Excellent doesn't quite rate you highly enough! I had been having increasing problems with pain starting in my lower back and running down my leg, down to the knee, particularly on the left hand side. I started down the usual route of going to the doctor, who diagnosed sciatica and referred me to the NHS physiotherapist. After months of waiting, in increasing discomfort, I got to the see the physio who gave me some exercises to go along with the painkillers I had been prescribed. After several weeks perseverance, it was no better; worse, if anything. Was this it? Would I be in pain now and on painkillers for the rest of my life?I was a member of David Lloyds at the time, though my activities were rather hampered by my problem. I'd seen the posters outside his treatment room at the gym and, since it was one of his days there, decided to knock and see if there was anything that Daryl could do for me. Luckily, he had a slot then and there.After a talk and some careful observation of posture, movement etc. he said that he could probably help and proceeded to teach me some stretching postures. After a few minutes of these, for the first time in months, the pain was almost gone! Positively miraculous. This was followed up by some massage on the bench, with instructions to do the stretches three times a day for the next three weeks, then go back for another session.Well, things just got better and better and, after a few days, I was totally pain-free, though I did as instructed and continued for the next few weeks until I saw him again.When I did, he could tell that things had improved from my posture. So, another massage and I was done. Now, I just do those same stretches once a week or so and the problem has never returned.Some time later, old knee problems flared up once more. Many years ago, I had been prescribed orthotics for pronation, but these had worn out and not been replaced. So, after the previous success, I consulted Daryl, who was confident that he could fix my problems without the need for orthotics.The first session was an evaluation, coming up with the appropriate exercises plus acupuncture and massage (which was really very painful, though I was warned). Over the next couple of months, I had maybe three more sessions, mostly with just the massage, but at the end of it, my knee pain had gone. It has not come back, two years later.I cannot recommend Moveology strongly enough. Both of the conditions for which I consulted him had been left uncured by tradition medical routes. However, in both cases, a handful of sessions with Daryl saw the problems gone completely, without the need for drugs or mechanical appliances. The guy is a magician!!p.s. if he tells you it's going to hurt, don't worry - he's immune to bad language. Highly recommend! Thank you Daryl for getting me back on track. I promise to keep up with the exercises �. A very professional service with excellent knowledge. Daryl's expertise is by far the best I have seen. I met a few osteopaths in the past and I can say that Daryl is the best of them all. I would highly recommend. Absolutely blown away with Daryl. He was recommended to me by one of my clients, had my first assessment which, identified what was wrong very quickly. He listened and the treatment was very professional. I will be having a few sessions due to my problems and it is money well spent, could not recommend him enough, skills are incredible. Everyone needs a Daryl in their life!! I am an ex-manager of an Osteopathic clinic, II would like to say that Daryl is an extremely competent osteopath as he really helped me. I took his advice and i still do the exercises nearly every day, which keeps me free from pain. After carrying a calf muscle injury for 18 months or so, I decided to enter the corporate cancer research race for life in May 2017. I would not have made it round the course without the excellent treatment received under the care of Daryl. Would definitely recommend Moveology. I can't speak highly enough about this company. The guys are professional and friendly so immediately put you at ease. They find the best solution to meet your individual needs and they've always done a brilliant job for me. Had excellent service from Doug when my achillies went, and when I pulled my hamstring during the Fathers race at my Daughters school sports day!! Very professional and made me feel comfortable when having my treatment. Would recommend to anyone! Amazing work! I have been involved with sport for many years. I attend the gym 3 times a week, where I have a personal trainer for one session, and run up to 10K twice a week. for a few years I have been getting hip pain. I have had hip pain for many years, but slowly pain began to occur in my knee and my neck. 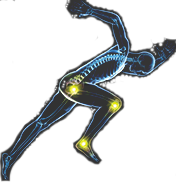 I have been to see a number of sports massage therapist and osteopaths, who seem to keep the discomfort at bay but not get rid of it. My personal trainer suggested that I give Daryl a try. We sat down and started to discuss all of my problems. He made me feel at ease immediately and assured me that my training would continue. Daryl informed me that my neck and knee were of a result of a compensatory pattern I had adopted. After two sessions I started to improve and was left with only the hip problem. After two more sessions there was only minimal relief. Daryl discussed the issue with me again and asked if there was anything else that had happened in the past no matter how insignificant. After thinking for a while, I remembered that when I was 4 years old a car hit me. I was told not long after the incident that I had fractured my skull and that I was unconscious for some time. After that session, Daryl implemented a new plan where everything started to heal a lot quicker. I now feel that Daryl had identified the main cause of all my pain issues and has enabled me to train pain free, something that I haven’t done in 15 years. After attending Daryl’s classes, I decided to go to him to sort out my lower back and pelvis issues where other practitioners have failed. I have had discomfort ever since giving birth to my first child. Daryl was able to determine, after some excellent analysis, that pregnancy was not the primary cause of my issue it had to be something else. After analising my gait, he saw that my head was always forward. He was able to guide me and realize that the issue stemmed from when I was a teenager, where I was involved in an unfortunate incident when a rounders’ ball hit me between the top of the nose and eye socket. I had remembered that for almost a year after I would suffer from headaches and have the occasional blackout. When Daryl diagnosed the root cause he then proceeded to treat me. He was able to treat my skull and neck and gave me specific exercises to teach my body new and better habits to hold onto. I am no longer in discomfort and can now run happily with no pain. I strongly recommend going to Daryl, as he is determined to get to the bottom of your problem, and uses his vast knowledge to help you understand the issue and empower you to handle the problem. I just wanted to say a huge thank you for giving up your time to come and discuss Sports Rehabilitation (among many other things!) with our pupils yesterday evening. We are so grateful and I know that they will have gained a tremendous amount from meeting with you. The GCSE PE group were talking continuously about the Fair today which is really encouraging; it was definitely a huge success and I am very grateful to you for your contribution. Your interactive display was amazing and a firm favourite with the crowd! I think you both barely had a moment to breathe let alone go and enjoy some refreshments! A huge number of parents commented at the end that they had no idea of the vast opportunities required for science subjects within sport, you both have certainly helped to change perceptions for which I am very grateful!